Yes, I've finally started watching Doctor Who. I started with the new series, but one day, I might go back in time to see the beginning. I finally understand all the fuss about the TARDIS and the sonic screwdriver, and I've only just begun. Why haven't I watched this show sooner? If you have been meaning to watch it, stop what you're doing, and start now. Or sooner. I've had friends nagging me for years. I should have listened. Several episodes have pulled me in. I adored the Ninth Doctor (Christopher Eccleston), and my favorites from the first season are "The Empty Child" and "The Doctor Dances." It took me a while to get used to the regeneration. This is a show where you can get attached, but not too much because the central characters are always changing. The character types remain the same to a small degree. But it is definitely a show for training Jedi - no attachments. Except that you can't help it. I've read that you get especially attached to your "first" Doctor and mine was the Ninth. The Tenth Doctor, portrayed by David Tennant, is grabbing my attention though. A few episodes in seasons two and three that stand out for me so far are "The Girl in the Fireplace," "Doomsday," and "The Shakespeare Code." Three of those episodes were written by Stephen Moffat. And then tonight, I watched Blink. If you haven't seen it, thar be spoilers ahead (yes, I do reserve the right to lapse into pirate speech whenever I want). I was grabbed from the start. I like to explore abandoned places and photograph objects that were left behind or the paper peeling away from the walls. You can bet I'll steer away from locations with statues from now on just to be on the safe side. The mood of the episode put me on the edge of my seat from the outset. I knew I was in for a ride, and I would have known even without hearing the echoing choruses of "OMG! Blink" that I read on Twitter. It had the feel of something special within seconds. I watched intently. I jumped. Possibly repeatedly. I might have scared my cats. It wasn't just that it was a scary episode though. It was intense, creative, disturbing in the under-your-skin sort of way, smart, and beautiful. I haven’t felt that type of fear since I watched Stephen King’s It when I was 10. Blink was also dramatic with light moments woven in seamlessly. Wibbly-wobbly timey-wimey? Frakking brilliant. The Doctor made the episode turn even though he was on the fringes. He tends to have a presence. He was charming and genius as ever, but Sally Sparrow. Wow. She had to be strong enough to carry the episode, but I think it was really important that she wasn’t overly so. Carey Mulligan as Sparrow was casting at its finest. She played Sally with innocence, spirit, and courage. If the character was written a little differently – if she had more disbelief, if she wasn’t as quick and clever, if she wasn’t as brave, if she had a bigger DVD collection… it obviously would have been different, but I don’t think it would have worked. As it is, the episode is a balanced recipe that was baked just the right amount of time. Every part fit delicately with the next and if one had been a tiny bit off, it wouldn’t have been the epic creation that it is. The Weeping Angel statues were a magical mix of grotesque, otherworldly, and majestic. They somehow didn’t cross the line into silly because that would have ruined the spell of the episode. The way the shot of the angels surrounding the TARDIS was lit and edited – it made me pull my blanket in closer just case I had to hide behind it. It was horrible and magnificent; it is easily the most fantastic editing I’ve seen in the series so far. Yes, I was blown away. And for a few days at least, I'll be giving any statues I run across extra wide berth. You can bet that every time I see an angel statue though, even decades into the future, I'll watch my back. Well done, Stephen Moffat. Well done. Hooray, another Who convert! "Blink" is just so choice. 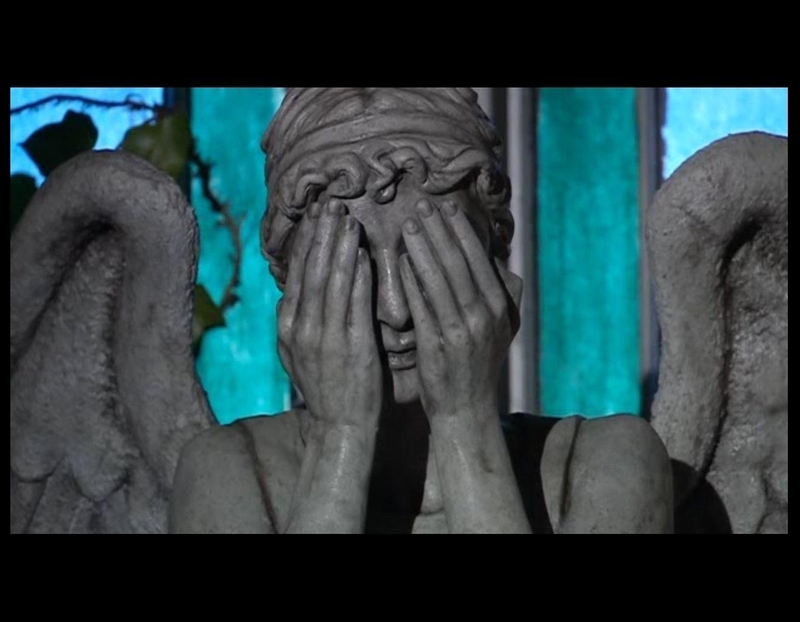 I must warn you...the Weeping Angels just get scarier and scarier. I think it's true that you never get over your first Doctor. Mine was Tennant, a friend's was Eccleston. But I find Matt Smith pretty irresistibly awesome as well. Happy viewing! Bravo! "Blink" was pure Doctor Who at it's finest! I too came to the Doctor late last year and went on a whirlwind viewing spree to be all caught up in time for the end of Tennant's run and the airing of Torchwood: Children of Earth. It was one helluva ride, let me tell you! But time and time again -- each time I saw that "Blink" was playing on BBC America, I'd sit down to watch. Wait until you get to Vincent and the Doctor in series 5. Yeah - this one is great! If someone hasn't seen the new Doctor Who - this is the one I tell them to start with since it's told from the perspective of someone who does not know the Doctor. Blink might have been the best hour on TV ever. I, too, am a recent Who convert, and (like yourself) I wonder why I hadn't watched it sooner. To say I was "instantly addicted" would be an understatement. I haven't seen Blink in several months but every time I see a reference to it, it still gives me the chills. Greatest episode of anything ever. Eccleston was my first doctor, as I went in order, so he'll always be special. But I fell hard for Tennant, and I highly doubt I could love anyone as much as him. So glad you made it to the Doctor Party! My first Doctor was Tom Baker, but I can't say I really got into the show until the reboot with the Ninth. Loved him, loved Tennant, and now I'm loving Matt Smith. Getting over regeneration anxiety is facilitated by having great new doctors. Oh and the actress who played Sally Sparrow was in "An Education," totally not sci-fi but a biographical period piece set in 1950s London. I still kept looking for the statues. I'd never seen Doctor Who but a friend had me watch this eposide. I agree. It really hooked me. "Blink" is probably the single best episode in the show's almost-fifty years, but you still have some excellent stories to come. Tom Baker drew me in back in the day. I will admit I lost interest during the Davisson era but Eccleston brought me back and Tennant was just...superior. Blink was such a awesome episode and the way they went back to it with Matt Smith was inspired. I've been trying to get in Doctor Who but haven't been consistent with it! I took care not to read the spoilers and check this episode out! I haven't seen Dr Who or the episode "Blink" but I had a friend work the statues into a D&D 3.5 adventure...and it was exciting and scary! After that and your review here, I definitely have to get on the ball and watch Dr Who! I've seen all of the new show and 'Blink' remains one of my favorite episodes - that and 'The Empty Child' - they both *still* scare me. Plus 'Empty Child' has captain Jack -*swoon. Wow! I'm amazed at all the insanely positive responses about this episode. I've yet to meet a person who wasn't totally in love with it. I'm so enjoying exploring this whole new universe. I'm just embracing it, and I attended Gallifrey One this weekend. Doctor Who fans (as evidenced here already) are just the nicest sort of people. Everyone was welcoming and willing to fill in some gaps and tell me all about the previous doctors. It was amazing. The best thing about 'Blink' was the actual use of timetravel to tell a story. Given the central character is a timetraveller, it's amazing how few of his stories actually use it. Fortunately Steven Moffat is the best thing that's happened to the Who in a LOOOOOONNNGGG time. And now he's the exec producer and show-runner! Matt Smith's first series is great and it can surely only get better from there! And the better news..the Weeping Angels come back in series five. Which is, by far, the most consistent of the new Who seasons. Yay! One more member for the Who legion! My first Doctor was Tom Baker, but my favorite is Christopher Eccleston. I love the his moodier take on the Doctor...and how could you not love his "Everybody Lives" speech at the end of "The Empty Child"? *Swoon* That being said, Tennant is great and Matt Smith is doing a fine job. Did I mention how much I love Eccleston? Yes? Ok, just making sure. إذا كنت تبحث عن أشد مؤسسة نقل أثاث من العاصمة السعودية الرياض إلى الدمام ، إليك هذه اللحظة عميلنا العزيز أفضل مؤسسة تقوم بتطبيق جميع خدمات النقل للأثاث من العاصمة السعودية الرياض الى الدمام بأقوى جودة وأفضل الأساليب الجديدة فى للنقل مع إدخار أمهر العمالة للقيام بتلك الخدمة على أعلى مستوى من الخبرة والجودة.